Fendi Chateau Residences is an ultra-luxury, boutique condo development with just 58 oceanfront, flow-through residences and rising 12 stories. Fendi Chateau Residences was designed by world-renowned architecture firm Arquitectonica with interior design by Fendi in collaboration with Fanny Haim. With 300 linear feet of private beach and world-class amenities, residents of Fendi Chateau Residences will relish in the 5-star, white-glove service. Fendi Chateau Residences has three-, four-, and five-bedroom floor plans ranging in size from 3,325 to over 7,000 square feet (see Fendi Chateau Residences floor plans). Each unit at Fendi Chateau Residences has 10-foot high ceilings with floor-to-ceiling glass windows; private elevators; staff quarters; terraces up to 12 feet deep; and a chef’s kitchen complete with Fendi cabinetry, Gaggenau appliances, and climate-controlled wine cabinet. Residents of Fendi Chateau Residences will have access to luxury concierge services by FENDI Attache, business center, private restaurant, private cinema, Kids’ club, fitness center and spa. Fendi Chateau Residences is located just two blocks south from Shops at Bal Harbour. 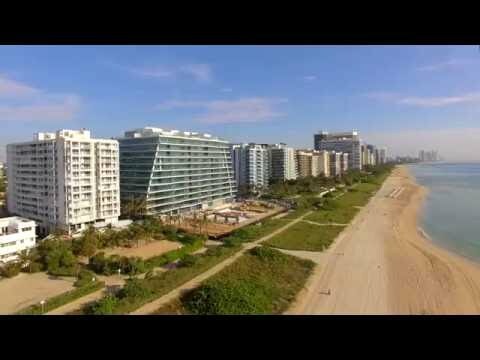 In addition, it is within a 30-minute drive to the Aventura Mall, Fort Lauderdale Airport, Miami International Airport, and South Beach. Which utilities are included in the Fendi Chateau Residences condominium association dues? AT&T U-verse cable package (U200), water, sewer and trash removal are included in the condominium association dues.